With the new tug MED XXIX recently put into service, Turkey-based Med Marine's new fleet of six vessels is now complete. 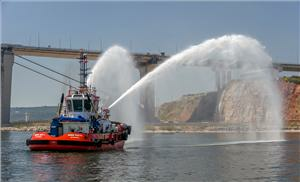 The ASD-type tugs are designed for harbor and terminal operations as well as for coastal towing. The main propulsion for the RAmparts 2300-MM consists of a pair of Caterpillar CAT 3512C engines, each rated with 1,380 bkW at 1,600 rpm, and each driving a SCHOTTEL SRP 340 azimuthing stern drive unit with fixed-pitch propellers of 2,100 mm diameter enabling a free sailing speed of 12 knots. A diesel-driven fire-fighting (FiFi) pump for the tugs' FiFi E system is mounted on one of the main engines. "As can be seen throughout the fleet, the reliable SCHOTTEL Rudder propellers have proven to be suitable for many applications, as they come in a robust design and offer easy handling for maneuvering. That is why we rely on SCHOTTEL for propulsion," said Med Marine's Muhammet Gökhan, Business Development Manager.